With the new 2000AD out, I think it's safe to talk about the final episode of The Vort without spoiling anybody's fun. Reaction has been mixed, but not as virulent as I'd feared; the feedback I've had has all been very measured and reasonable. 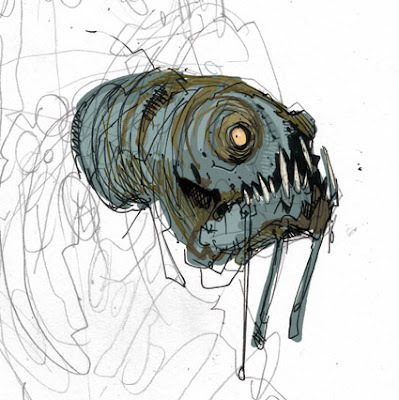 Much of the feeback has been along the lines that The Vort had developed its own very distinctive character, so having Crispy turn out to be Lobster Random felt a bit jarring, but most people seem to have enjoyed it overall. Meanwhile, the Big Reveal finally gives me the chance to give credit where credit's due; first of all, G. Powell was of course Si Spurrier (which explains how "he" could get a series at 2000AD apparently without doing a Future Shock first). Thanks to Si for writing such a meaty story for me to work on; not only was it chock-full of cool stuff to draw, but each five-page episode was a journey in itself, yet still smoothly built up the overall picture as the series advanced. A classic example of the "show not tell" school of writing. My original concept design for the alien Frogs, with whale-like faces. Big thankings too to Carl Critchlow for his open and generous collaboration in the design of the world of The Vort. 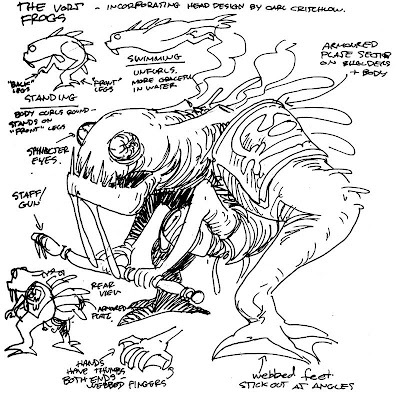 Because the next series of Lobster Random re-uses settings from The Vort, we both supplied designs to the series; most notable was Carl's design for the faces of the Frogs. 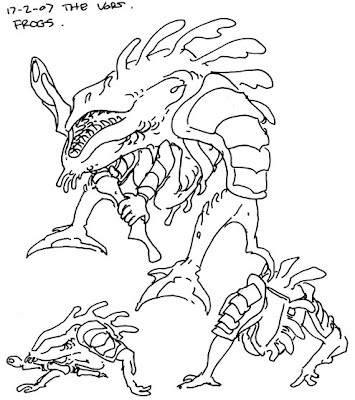 My original concept (above) featured a back-end-first torso design (inspired by the work of SF illustrator Wayne Douglas Barlowe) and a cetacian-type head with a flip-top jaw. This looked really alien but didn't seem to me to have the sinister and vicious-looking quality demanded by the script. Happily, Carl had come up with an excellent head design (above) but was stuck for a body. I glued the two together (below) and the result was pretty much what appeared in the strip - though in practice the eyes drifted a bit further down towards the jaw, making the head look a little more chameleon-like. 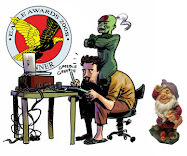 Carl Critchlow's head on my body; the composite Frog design that made it into the strip. Have really enjoyed the series, I feel the colouring and layout conveyed the oppressiveness of the Vort and I'm happy old Random is back, good on ya! The fact that there was a massive twist and it was totally unexpected was really great. Don't get enough of that sort of thing these days.